My own journey with playing stringed instruments began, as most of our students, in a school Orchestra class. It was the fall of 1985 and I was in the 6th grade. The Orchestra program at my middle school only met two days a week so I chose to split my time between Orchestra and Band. I continued playing in both the Band and the Orchestra until my Junior year in high school when I decided, like many students I have met, that being in the Band was much "cooler" than the Orchestra. That is a choice I would not regret until four years later. My Senior year in high school I discovered my calling was to be a conductor; a Band director I thought. I attended Jacksonville State University because of the incredible Marching Southerners and the outstanding Music Education program. While in college, Dr. Victor Vallo started a community/university Orchestra of which I became a founding member and still play in today. When the time came to do my student teaching, I had decided that my heart was really in the Orchestral aspect of Music Education. Dr. Vallo was instrumental in finding me just such an opportunity and I did my student teaching with Ms. Claudia Shelton right here in the Gadsden City School System. A few years later, a Strings teaching position came available in the Gadsden City School System and I have been here ever since. 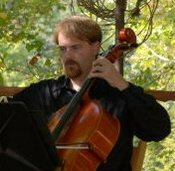 Over the years I have played in numerous string quartets, musical theatre Orchestras, church Orchestras, the Gadsden Symphony Orchestra, and a brief stint with the Red Mountain Chamber Orchestra. I've had the opportunity to play and record with the Grammy Nominated world music group Sapien, and have been playing Bass in various bluegrass bands since about 2004, including the Distant Cousins and Kelli Johnson and Chimney Peak. Suffice it to say that I love music and find it personally therapeutic to play music in many forms. I personally believe that the Gadsden City School System Strings program is a beacon of hope in our state and proof that Arts Education, and particularly Strings programs are an important aspect of our youth's education. I'm so very humbled at this opportunity to be a part of this outstanding program and to nurture our students toward what I hope will be a lifelong love of playing music.